Pla(tonic) – Flawed, Cracked… But Rare! Plato is a major influence in my life now. Especially in my non-natural relationships… in the only other relationship I have other than friends and relatives. 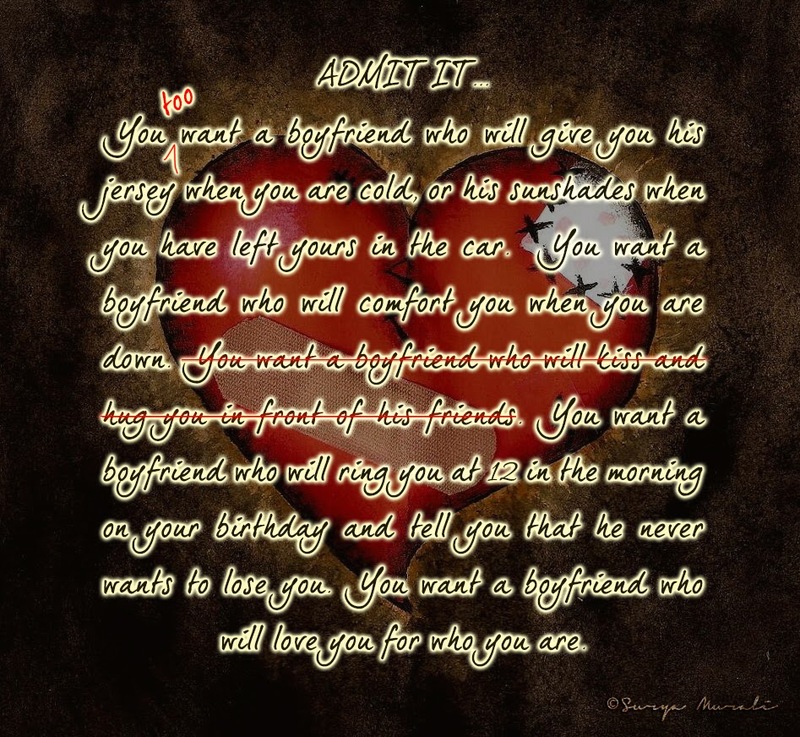 A platonic relationship with my man-friend (he is too much of a man to be called a boyfriend)… three years old and still going strong in spite of all those nay-sayers who told me it just wouldn’t last. People claim there really can’t be a platonic relation between two members of the opposite genders over an extended period of time… especially if the two are very close. I’d say… look at us… we are really close, we have been true to the definition… Friends without benefit? 😉 And the commitment we have to the relationship is as good as in the deepest, most romantic liaisons… it stops me from having a no strings attached fling or an emotional attachment to any other guy. Having lived his life… casual flings, heartfelt romances and all… he has come to a point where pure, unadulterated, intimate love without the physical intimacy and the heartache is like a balm to him. Though, I have no experience of physical love, I have had enough heartache. First, a relationship gone sour because of the lack of physical proximity and intimacy and then this, a relation that works despite the lack of the same. I have had friends ask me if I don’t miss it in my life (the intimacy, not the heartache! )… the answer is yes, of course… but I don’t really know what I am missing without prior experience… so, it is like missing a trip to the moon, probable but not possible. And anyway I tell them… books help, as in all of my life’s other adventures… it’s a happening life I live through them.